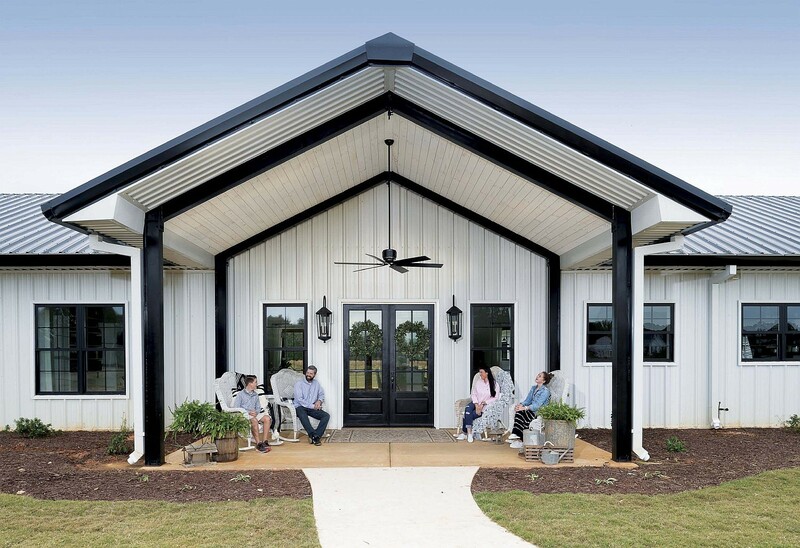 Take a tour of the newly completed modern farmhouse in Social Circle, Georgia. CLEAN & COZY. The gorgeous trim in the great room, which gives the space a polished look, was provided by Woodgrain Distribution. A tribal pillow, chunky knit throw and tasseled throw add cozy touches, and pops of color warm up the white-painted area. Katie found the distressed leather chafirs on Craigslist. FRONT-ROW SEATS. “We love our front porch, where we enjoy beautiful views of sunrises and sunsets. The ceiling is very high—at its peak it is about 20 feet tall,” Katie says. The outdoor findustrial-style fan from Hunter Fan Co.is the HFC 96 in matte black. “We originally planned to wrap the reddish-brown steel beams in reclaimed barnwood, but to save on costs we ended up just painting the beams black, which we really love!” Katie says. Oversized wfindows add lots of natural light to the interior of the home. Mision accomplished! 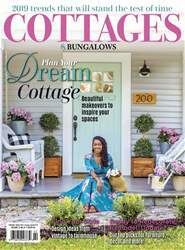 If you’ve been following the progress of our Project House build from the ground up in the past six issues, we are delighted to share with you the culmination of the construction and the details of the décor. To recap, Katie and Ryan Busenitz set out on a new-build journey to make their dream home—a modern findustrial farmhouse on an 11-acre plot of land—come true in Social Circle, Georgia. “It’s a tiny town with only one traic light, but it’s crazy how many stars we can see at night from our farmhouse!” Katie says. They planned, designed and built it themselves with the help of many generous donors and sponsors (see Sources, page 128).